A story that took itself seriously, dialog and cast that delivered fantastic performances...a pulse pounding rock soundtrack from Queen meshed to make for a classic movie. I am Connor MacLeod of the Clan MacLeod. I was born in 1518 in the village of Glenfinnan on the shores of Loch Shiel. And I am immortal. — With that phrase uttered in 1986, a cult classic was born that would spawn several sequel movies and a television show. That film, Highlander, is now celebrating its 30th Anniversary. To commemorate the occasion, Lionsgate Home Video has released the Highlander 30th Anniversary Edition – Director's Cut on both Blu-ray and DVD. Highlander tells the story of Connor MacCleod (Christopher Lambert; Mortal Kombat), an immortal from the 1500s, living in the modern era. For four hundred years, Connor has been living a secret life with other immortals until the time of The Gathering. When that occurs, they will all feel a pull to a distant land (aka New York City) to compete for the prize, and to be the only one left still alive. If you started humming Queen's Princes of the Universe while reading the above synopsis, you already have a very good idea what the film is about. To those who are now even more confused than when you started reading this review, let me try to light your way... Mirroring today's comic book fascination, the early to mid 80's was dominated by swords and sorce. Ever year, a film came out that had to do with the subject. Most eventually were forgotten but Highlander didn't suffer that fate. With a strong cast, including Sean Connery (James Bond), Clancy Brown (Starship Troopers), and Roxanne Hart (Chicago Hope), the film had everything action/science fiction fans clamored for. A story that took itself seriously, dialog and cast that delivered fantastic performances, great action and swords fights, and a pulse pounding rock soundtrack from Queen meshed to make for a classic movie. ● The Making of Highlander documentary - A 2-hour Four-part documentary. Part I: The Legend Begins; Part II: The Visual Style; Part III: A Strong Woman; and Part IV: The Producer's Point of View. ● Deleted Scenes - This extra is comprised of 5 different deleted scenes from the film. ● Interviews with Director Russell Mulcahy and Actor Christopher Lambert - Both men discuss their personal experiences with the making of the film. ● Archival Interview with Actor Christopher Lambert - An interview with the star of the film, in French. ● Trailer - The original theatrical trailer for the film. With Highlander's 30th Anniversary edition being released on both DVD and Blu-ray, it is only a matter of time before it is released in 4K UHD, which is what I am personally waiting for. Highlander is an amazing film, but it is a shame the series faltered after the original film's release. If you are a fan of the film and never owned it, then this might be a good stop-gap purchase for you. If you do already own this classic film, hold off until the 4K scan is released. 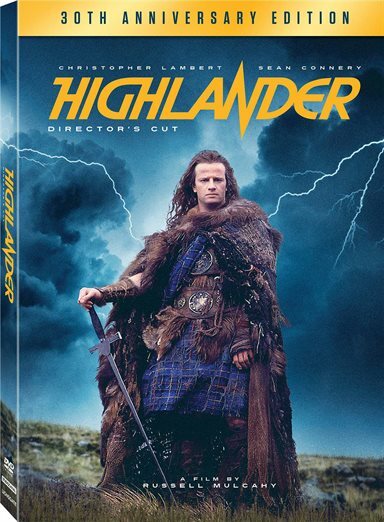 Download Highlander : 30th Anniversary from the iTunes Store in Digial HD. For more information about Highlander visit the FlickDirect Movie Database.